Every fall we make our annual visit to the Big E. This year the Colin and Lauren were tall enough to be able to go on most of the rides. They were able to enjoy the Giant Ferriswheel, a haunted house and a four person roller coaster called the Crazy Mouse for the first time. Of course, everyone enjoyed the traditional fair foods like cotton candy and candy apples. 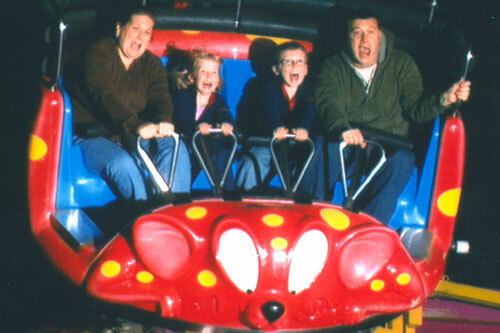 The Crazy Mouse (above) was just “scarry enough” for all use to enjoy. We also enjoyed driving into each other at the bumper car ride and going down the giant slide. Today is a big day for our family. Colin and Lauren went off to Kindergarten this morning. For the past few weeks we have been preparing for this big event by picking out book bags, lunch bags, school supplies and the perfect attire for their big day. They have both been a little nervous and excited to start in the big school. They really are big kids now which makes mommy a bit sad but also very happy to see them grow up into such great kids. They decided to buy lunch today (hopefully they like it). We drove them to school this morning and will be waiting to pick them up off the bus this afternoon. Where does the time go?!? Here are a few pictures from their first day of Kindergarten.